Yesterday, before doing errands, Clif and I chopped vegetables and chicken sausage and put them—along with chicken broth, water, tomato paste, and spices—in the slow-cooker. 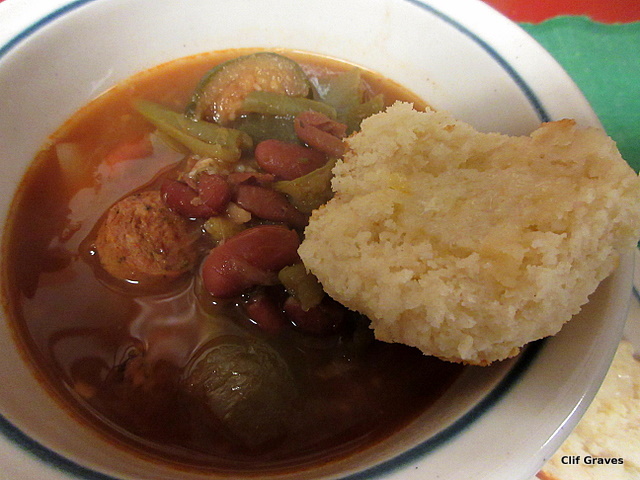 We added plenty of red beans. Finally, my not-so-secret ingredient, a little soy sauce. Off we went to do errands, and when we came home—voilà!—the house was filled with the spicy smell of simmering soup. Burni, we did have leftovers. I didn’t include the recipe. I’ll add it to the piece in the next day or so 😉 And, yes, there wasn’t much measuring. Somehow I’m not surprised with the lack of measuring! 😛 I’ll keep an eye out for it – good one for me to throw all together before heading out to work. Shannon, it’s pretty darned good. I agree! I use my slow cooker a lot, and I wouldn’t want to be without one. Yum, indeed! I ended up using white beans and leftover chicken in mine. Soup is so good on a frosty day! Bean soup is so versatile! That’s one of the things I love about it.